Release notes: Limited edition (1000 copies of each format) double album from a magical night in Asbury Park, New Jersey in August 2017. The incendiary new GBV line-up of Robert Pollard, Doug Gillard, Kevin March, Mark Shue and Bobby Bare Jr. plays songs from the 2017 albums How Do You Spell Heaven and August By Cake, along with a healthy dose of GBV classics and a cover of The Monkees to boot. 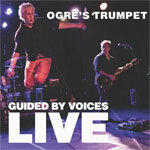 Excellent sound recording and the band's performance smokes all the GBV bootlegs.